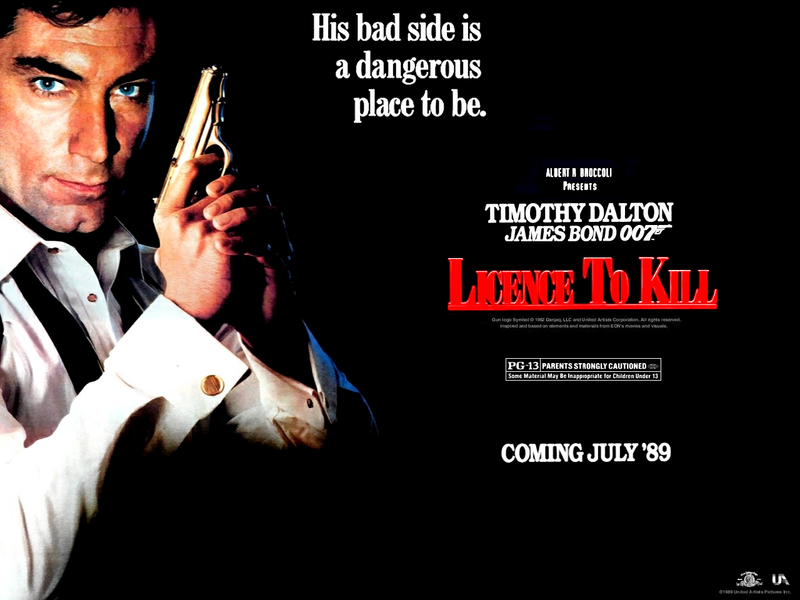 Licence to Kill was Timothy Dalton’s second and last time as Bond and it carried on the harder edged bond that had started with The Living Daylights. Luckily for Dalton, his last film is not only good, but it’s one of the best Bond films of all time. The film starts with Bond and Felix Leiter on their way to Felix’s wedding. Felix is now working for the DEA and is informed that drug baron Franz Sanchez is out in the open. Despite this being his wedding day, Felix takes Bond and gives chase after Sanchez. There’s a cool shootout that leads to Sanchez flying away and Bond, Felix and the DEA give chase. Bond ‘goes fishing’ and manages to get a rope around Sanchez’s plane and catches him for the DEA. Bond and Felix then parachute down to Felix’s wedding venue, and the credits roll. This is a great scene and not only does it set up the villain of the piece but it also establishes Felix’s and James’ friendship. During the Leiter wedding Sanchez stages a breakout and escapes police custody. He tracks down Leiter and his newly wed Mrs Della Leiter, kills Della and feeds Felix to some sharks. He doesn’t kill Felix though, and takes his mutilated body back to his house where Bond finds it. From there Bond goes on a mission to avenge Della’s murder and Felix’s mutilation. But this isn’t an MI6 sanctioned mission, and when M finds out he brings Bond in. Bond can’t carry on his mission of vengeance if he goes back to work so he resigns and becomes a rogue agent. The whole plot is more simple and more grounded than many Bond films especially compared to some of the previous films. The plot does get more complicated as the film goes on, when characters from the Hong Kong narcotics squad are introduced and when Bond starts playing the members of Sanchez’s group off against each other, but the film never gets too complicated. The plot is also a definite product of its time, with a story of Columbian drug barons being straight out of the headlines at the time, and the themes of drugs being a mainstay of many 80’s films. That doesn’t mean LTK is any less of a Bond film though; it still has many of the James Bond components that people would expect. The villain for example, Franz Sanchez played by the great Robert Davi, is a classic insane Bond villain who even has an evil lair. He’s aide by the strange henchman Dario played by Benicio Del Toro, who is a strange character; he shouldn’t be threatening and doesn’t get much screen time but he is elevated by a great performance by Del Toro. The Bond girls in LTK are a mostly good mixed bag. Lupe Lamora, Sanchez’s girlfriend played by Talisa Soto, is a slightly useless addition who helps Bond on a few occasions but overall is a bit useless and not really needed. A much better Bond girl is Pam Bouvier played by Carey Lowell, who in my opinion the best Bond girl since Diana Rigg’s Tracy in OHMSS. She can hold her own along with Bond and is never made to become a damsel in distress. In fact, in one scene, the roles are reversed and she helps Bond out. Q is back as well, again played by Desmond Llewelyn, and LTK is Q’s most screen time yet and he even get’s out in the field with Bond. He’s as great as ever and its great to see him doing something different from being in the lab back at MI6. And finally Dalton, who is a highly underrated Bond and turns in his best performance in LTK. He’s a much different Bond to the previous Roger Moore, and plays Bond much more like the Bond from the books. He’s cold, angry, ruthless, and doesn’t crack many jokes but it is a welcome change from the camp films that came previously. Not only does the film have some great performances, it also has some amazing action. The opening sequence, as previously mentioned, is awesome and there is a handful of fights and shootouts scattered throughout. It’s cool to see Dalton performing a lot of his own stunts as well, something Moore didn’t do too much of. Another highlight is the scene on baddie Milton Krest’s boat which see’s Bond go from fighting on the boat, to fighting underwater, to water skiing after a plane filled with money. But the real highlight of the film, and a highlight of the whole series is the tanker chase at the end of the film. After Bond burns down Sanchez’s evil lair Sanchez escapes in one of his oil tankers full of cocaine and Bond gives chase. What follows is one of the most awesome action sequences in the whole of James Bond history and is aided by the awesome score from Michael Kamen, who also scored other 80’s classics such as Lethal Weapon and Highlander. The Bottom Line: Licence to Kill is one of the best Bond movies, and is defiantly in my top 3 Bond films. It is a different film to the others and is more reminiscent of the later Daniel Craig films like Casino Royale rather than the Roger Moore films that Dalton’s films followed. There’s a great villain, the action is some of the best with the tanker truck chase being my personal favourite Bond action sequence of all time, and the Bond girl is perhaps the best so far. With LTK the Bond series ended the 80’s in style.